HAG-240, Dreadnought Steel String Guitar from Highland Guitar Company. Highland Guitars Releases the HAG-240 Acoustic Guitar. The HAG-240 is the latest addition to the Highland Guitar Company's acoustic guitar series. The solid spruce top on the HAG-240 has been finished in what Highland describes as Sienna Burst Satin. Other features include a laser designed rosette, Mahogany back and sides, rosewood fingerboard, grover machine heads, and artfully designed wood inlay on the neck. "The lasered top gives each guitar its own unique look and finish", according to Power Group's Sales and Marketing Director Rick Carlson. "The reaction to the instrument has been fantastic and crosses over age barriers. Where teens and tweeners might see the HAG-240 as an acoustic with attitude, seasoned players and store owners see and hear a finely crafted instrument that is an attention getter that stands out from anything else out there. " Highland instruments are set up and strung with Elixer strings prior to shipment. The Highland HAG-240 case features a "Faux" Gator skin exterior, a plush interior and a built-in Hygrometer. The Highland Guitar Company is distributed exclusively by Power Group Ltd and offers a full range of fine acoustic, archtop, and solid electric guitars. Highland instruments retail from the mid $200's for an entry level acoustic to the mid $700's for a top of the line archtop. The optional hard shell cases retail from $120 to $150. 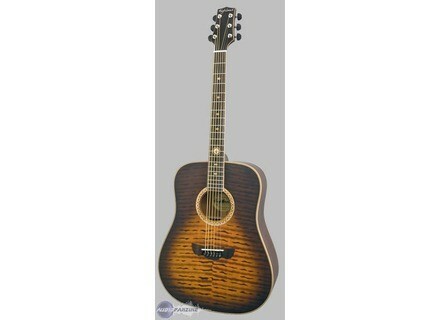 For more information, visit their web site at www.highlandguitarcompany.com. Coolpedals Dirty Devil Coolpedals presents the Dirty Devil, described as a particularily versatile overdrive /distortion pedal. Gibson Guitar Launches Dark Fire Gibson Guitar announced today the limited availability of the Gibson Dark Fire guitar. Pro Tone Olde Wolbers Small Tone Pre Amp Christian Olde Wolbers and Pro Tone Pedals Present the 'Small Tone Pre-Amp' Pedal.